How will Australia's eucalypt forests respond to changes in atmospheric carbon dioxide (CO2) and climate? A continuing rise in the atmospheric CO2 concentration is inevitable, and its impact on Australia's forest and woodland ecosystems must be considered in our environmental management and water catchment strategies. reductions in stomatal aperture that means decreased water use, and impact on the amount of water flowing into streams and rivers as well as groundwater recharge. These direct effects have largely been studied for Northern Hemisphere tree species, whose biology and origins can be distinct from Australia's native flora. Information is urgently required to underpin Australia's environmental and catchment management strategies for the 21st century. The Hawkesbury Forest Experiment in Western Sydney, Australia, is designed to provide this information. The experiment brings together an expert team of researchers from a number of universities to address these concerns. 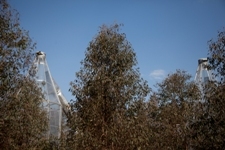 Our broad focus is on developing a predictive understanding of the growth and carbon storage potential and productivity of both managed and unmanaged eucalypt forests, growing in typical Australian conditions, and their responses to the rising CO2 levels that will occur during the next 50 years. The project is a carefully integrated program of experimental and modelling approaches. The centrepiece of the project is a field facility with 12 CO2 and temperature-controlled whole-tree chambers provided by the Swedish University of Agricultural Sciences (opens in a new window). The whole-tree chambers can house entire trees up to 12 metres tall. This unique facility is the first of its type in Australia and the Southern Hemisphere. 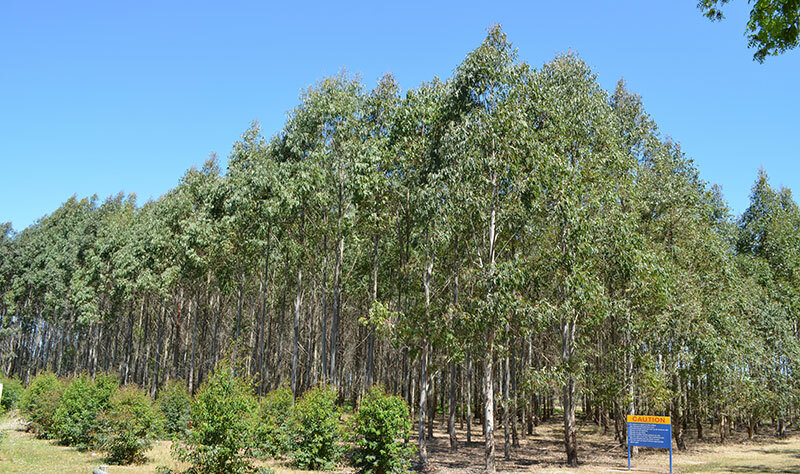 We are growing a major Eucalyptus species (E. saligna) native to the Hawkesbury region, under conditions expected in a future, higher CO2 world. The experiment involves chambers controlled at CO2 levels expected within the next 50 years. Water deprivation will add additional stress to half of the chambers in order to help unravel possible interactions between elevated CO2 and drought. 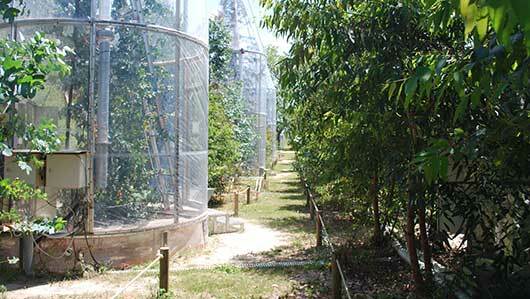 The Hawkesbury Forest Experiment was funded in part by the Australian Greenhouse Office scheme for Planted Forests. The Australian Greenhouse Office (AGO) was the world's first government agency dedicated to cutting greenhouse gas emissions. It was established in 1998 as a separate agency within the environment portfolio to provide a whole of government approach to greenhouse matters. For more information about the Hawkesbury Forest Experiment, please contact Professor Mark Tjoelker.